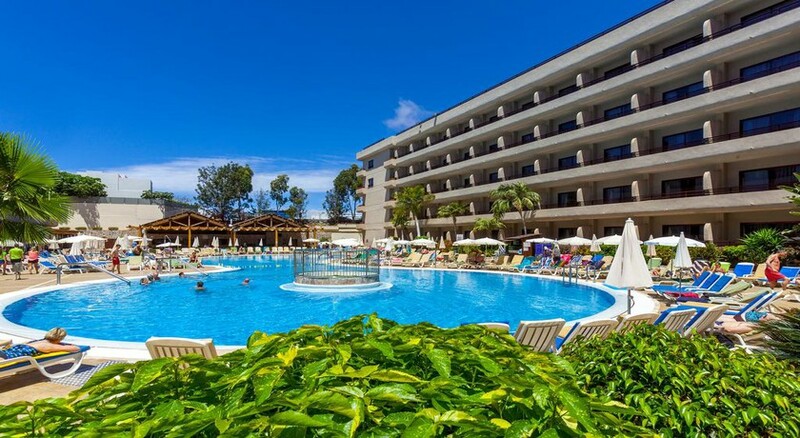 Set on an ideal location of Costa Adeje, GF Fanabe Hotel is a perfect spot to spend your family holidays in Tenerife. The hotel is just a stone’s throw away from the Fanabe Beach with a mix of bars and restaurants just a few steps away. 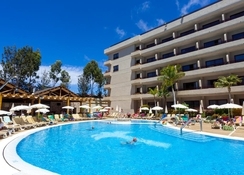 The hotel features an eight shape outdoor swimming pool surrounded by tropical plants and a sun terrace. Other than this, there are four more swimming pools, two on the side of the hotel and two on the rooftop. Those who prefer to relax can try the sauna or Turkish bath with massage treatments. The hotel hosts a variety of entertainment activities to keep you happy and entertained, and with a provision of facilities such as a sports ground, gym, aqua aerobics and a kids’ club, you surely have everything you wished for. The hotel’s main buffet restaurant serves three meals a day with show-cooking and themed nights, while the poolside restaurant serves a la carte snacks and lunches. 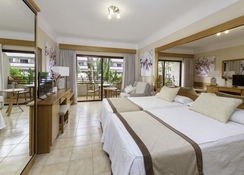 The rooms are air-conditioned and spacious and come with a pool-view balcony. With just a 10-minute walk away from the beaches of Playa Fanabe and Playa del Duque, GF Fanabe Hotel is a perfect place for beach and watersports lovers, alike. There are various bars, shops and restaurants just steps away from the hotel. The place has even got its own waterfall, which will give you the feeling of a laid-back destination. 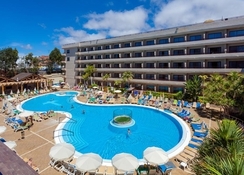 The party bars and clubs of Playa de las Americas are just a stone’s throw away. The Tenerife South Airport is 18km, making it convenient for the guests to board their flights on time. The hotel has a selection of pretty rooms, well-furnished with all the basic amenities. They come in four categories that include Double Room, Accessible Room, Family Room and those looking for some extra space and luxury can opt for Junior Suites that comes with a lounge area. All guestrooms have a balcony/terrace with cool pool or ocean views. Other amenities include a satellite TV, a la carte minibar (surcharge), free Wi-Fi, telephone, natural light, room service safe (surcharge) and a private bathroom with bathtub/ shower combination and a hairdryer. The Adeje Buffet Restaurant serves breakfast, lunch and dinner with show-cooking and regular theme nights. Hit the Pool Snack Bar & Restaurant to have food and drinks under a single roof. Or go to the Solarium Bar, Wine Cellar and Drago Discotheque for alcoholic and non-alcoholic beverages. If you want to have tea, coffee and snacks, then the Hall Bar-Cafeteria is the right place to be. If you require a special dietary, then let reception know in advance. The hotel has sports installations like five swimming pools and a playground for kids. Additionally, there is an aerobic gymnasium, sauna room, Jacuzzi, Turkish bath, massage therapies and much more. The five swimming pools in the hotel include a large pool, two rooftop plunge pools and two pools on the side of the hotel. For those who wish to pamper themselves can try the hotel’s sauna or Turkish bath. The little ones will be kept busy with the hotel-run kids’ club. Apart from this, the hotel also facilitates a large hall for conducting events and meetings or social gatherings. We booked this holiday on recommendation from a friend. It exceeded our expectations in all areas except the tightly controlled A/I drinks where you had to queue every time. Other than that it was excellent and good value. We will be returning. Set back no sea view. Set back no sea view. Sun around pool area limited.